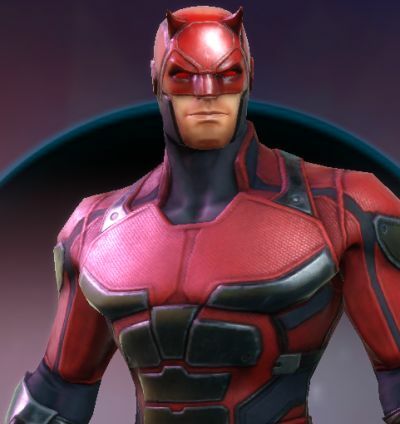 In today’s article, we’re going to talk about one of my favorite characters in Marvel Strike Force: Daredevil. Even though he is not a popular choice among other players, I’m actually loving his skills and I am having a great deal of success using him in both Arenas, as well as other types of battles. 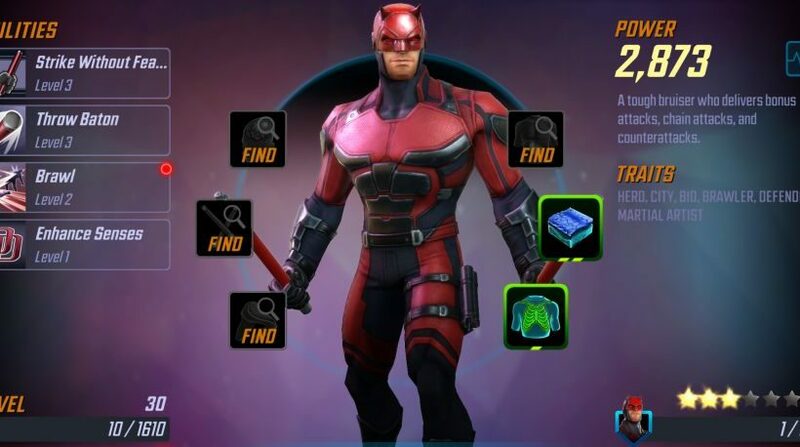 So today we’re going to do a quick Marvel Strike Force Daredevil Review where I will share my impressions on him, as well as all the details you need in order to decide if he’s indeed worth getting and using or not. 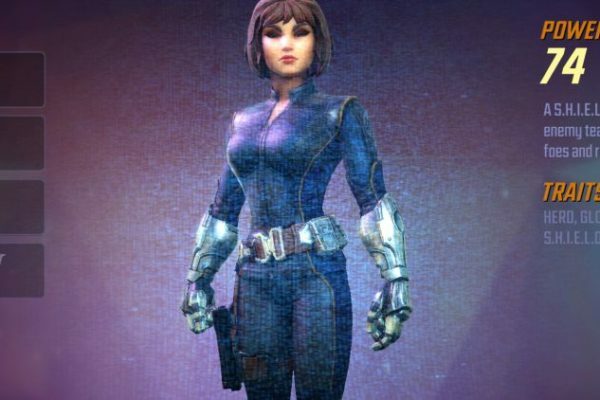 Don’t forget that we have also published another character review, for Quake. 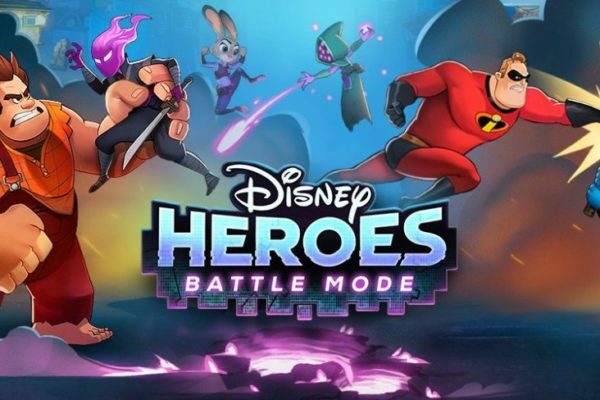 We’re also going to cover all the characters in the game, so make sure to check back often to find out more about your favorite Heroes or Villains in MSF. Description: A tough Bruiser who delivers bonus attacks, chain attacks and counterattacks. Throw Baton: (level 3) Attack primary target for 110% damage. 20% chance to Chain 1 target for 100% damage. 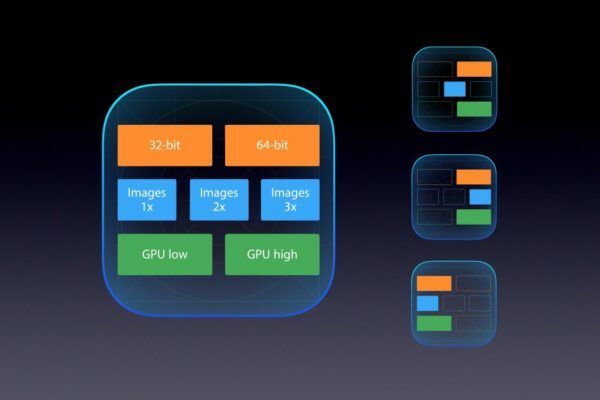 Gain Counter. (additional upgrades increase the chance to chain, as well as the damage dealt and eventually Counter lasts 2 turns). This character was offered for free to all players who pre-registered to play the game, which was indeed an amazing bonus. But, unfortunately, there’s not much you can do if you didn’t sign up for the bonus. You can unlock Daredevil by drawing shards from a Premium Orb or other Orbs in the game. 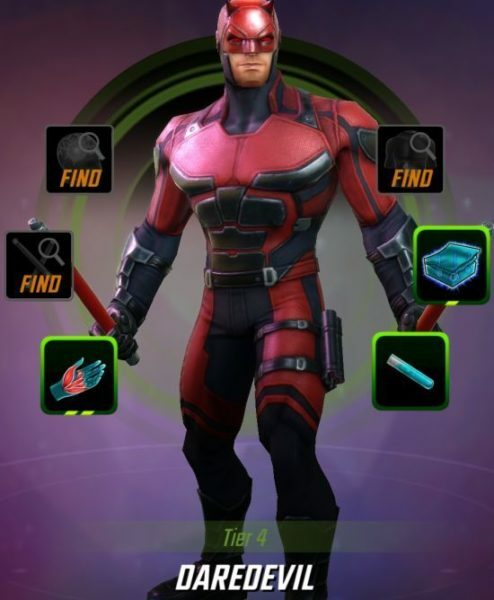 At the moment of writing this article, you can also farm Daredevil in the Arena Store, where you can purchase 5 Shards for 500 Arena credits. 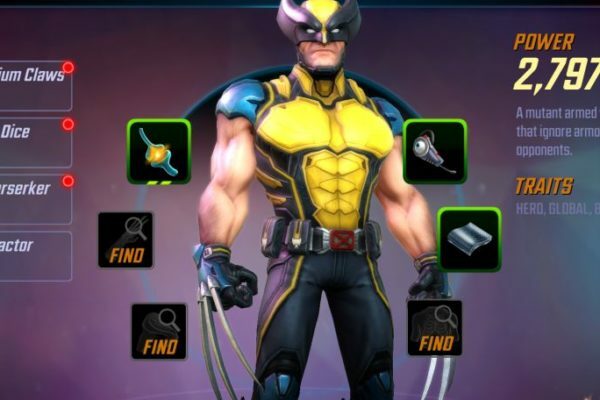 This should be the easiest method to farm him and you should do it as often as possible – although I would personally suggest focusing on getting Quake first in the Arena store. As I said, I really love him, especially since he unlocks at 3 stars and is, for new players who have just started up, the best character you can have. He’s deadly thanks to his Brawl skill which won’t only easily deal massive damage to one enemy, but also chain multiple other targets for tons of damage. One of the best skills in the game for sure! He is easy to level up and Tier up especially, has decent health and deals a lot of damage. He also never misses in the game, which is always a bonus. All in all, I consider Daredevil to be a great player for those starting up, especially if you manage to start with him unlocked. Extremely helpful, but becomes a bit less useful as you climb up the ranks and get better heroes unlocked. This would be everything we have on Daredevil in this game. He’s really a good one, isn’t he? 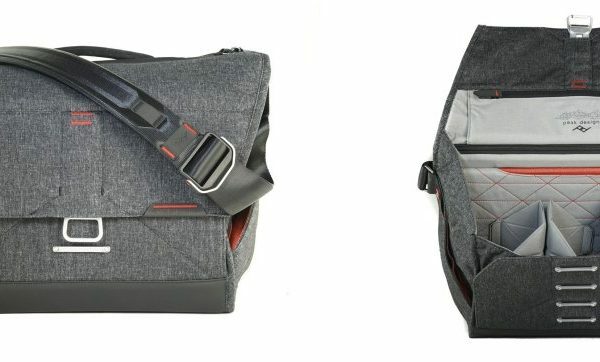 Let us know what you think about this guy by posting a comment below!